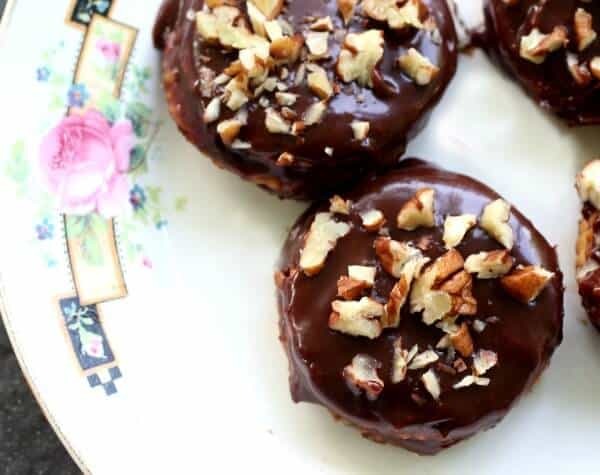 These easy, no-bake Rolo cookies are full of chocolate and caramel, then dipped in more chocolate with a generous sprinkle of pecans on top. Best of all they come together super-fast because you start with Ritz crackers. You know, my kids don’t stop wanting sacks and treats just because it’s 110F outside my kitchen window but that 110F degrees does stop me wanting to turn on my oven. I promise you there have been times when no matter how hard the air conditioner tries to keep up the kitchen is hot enough that butter pools in the butter dish. In other words, there is no way that I am going to bake cookies or anything else. I have two teenage boys once again and they are constantly wanting a snack but I can only afford so much fruit so I’ve pretty much got to come up with something they can eat that is easy and won’t set my 100 year old heart pine floors on fire from the heat in the kitchen. No-bake cookies and desserts are the answer, of course. Sometimes I feel bad because I feel like my kids are missing out on that freedom. I hate that they watch television (currently at our house they’re binge watching Gilmore Girls) so much and miss out on the things that I treasured. I remember my mom saying the same thing and I’ve realized that they will have their own special memories and magic because summer magic is something you experience on an individual level. It can be described to, but not experienced by, those around you. So, anyway, I’ll be sharing a lot of no-bake snacks and desserts this summer. I’ll probably talk way too much and share way to many memories but y’all know how to scroll down, right? Today’s recipe is really one of my favorites. If you have a microwave you can do these in about five minutes. 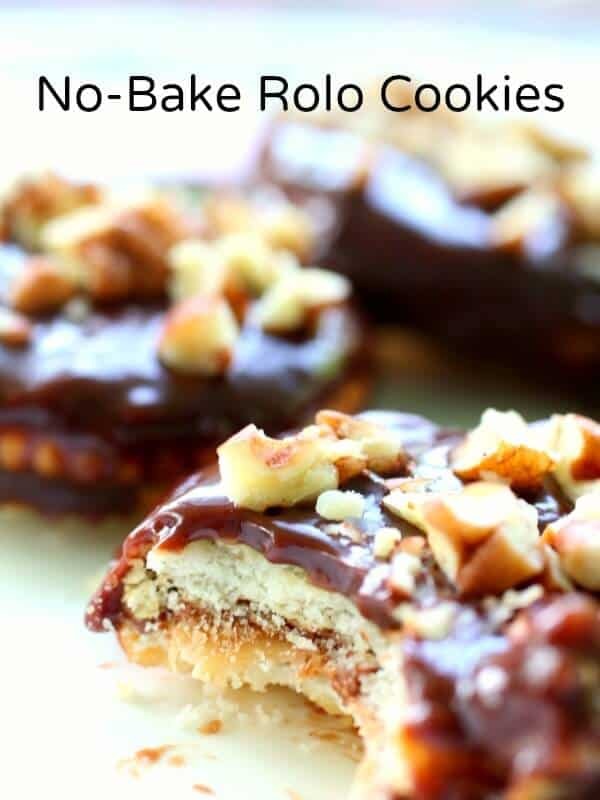 These no-bake Rolo cookies are so good that it’s just unbelievable. After all, who doesn’t like chocolate, caramel, and pecans? Chewy, crispy, crunchy, gooey goodness on a plate. So easy that your kids can make them with little to no supervision, depending on how old they are. If your house stays warm you’ll want to keep them in the fridge or the chocolate will be all melty. I am so excited to try these! I think I’ve told you before that I am a challenged baker. If I can make these with a microwave, I am all over that! 🙂 They are some of my favorites in the summer! OMG! I love Ritz crakers but haven’t had them in ages. Did someone say Rolos?!?! Yeah, you pretty much had me there. When you added in Ritz crackers, i was done. These sound freking amazing and I can’t wait to make some for my kids soon! Oh man… quick AND chocolatey?! Yummmmmm! I was obsessed with Rolo’s, especially semi frozen…they were so good! I need to get myself some and whip these up! These looks so easy to make. Perfect afternoon recipe for the kids and I to do together. Thanks. They really are! Thanks for stopping by. Right? I feel ya on the no a/c. several years ago we didn’t have it (broken, couldn’t afford to fix) for 3 years. In TEXAS! Ugh. These look and sound so delicious and are a great way to get your cookie snacking on without heating up the kitchen. I swear I could feel the heat you’re experiencing in Texas just by reading your post. I wish I could send you a cool breeze.